ESC: Your Choice: False Alarm Fines or Routine Preventative Maintenance, Electronic Systems Consultants LLC (ESC_LLC), Columbus, Ohio, Security and Life Safety at its best! The fallout from a malfunctioning alarm system extends well beyond the facility it is suppose to guard and protect. Evidence of this fact is everywhere you go as every community of any size has or is routinely creating false alarm fines, some of them substantial for repeat offenders. Burglar or fire alarm makes no matter, false alarms due to malfunctions are not tolerated by local communities any longer. Six years ago, the city of Toronto decided that the false fire alarm problem had reached epidemic proportions, so they decided to institute an aggressive solution consisting of stiff fines. “About 1,100 homeowners have received notices of fines for false alarms since April 1, after city council heeded the fire department’s plea to wipe out a provision allowing one failure per year without charge,” says Security System News. “Most or all received bills for $1,050 — $350 for each of three trucks routinely dispatched after a monitoring company calls in an alarm. Traditionally, most of those fined are owners of high-rises and commercial buildings” (Toronto levies heavy false fire alarm fines , http://bit.ly/1ldOvng). 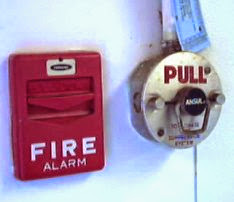 Fire alarms are not the only problem when it comes to routine maintenance and the issue of false and unwanted alarms. Burglar alarms also pose a tremendous problem for police when their owners do not take steps to routinely maintain them. There are two kinds of nuisance alarms that authorities are having issues with: 1) false, and 2) unwanted. False alarms are caused by components in a burglar or fire alarm system that trip for some unknown reason. Perhaps an aging, dirty smoke detector detects the presence of spiders, or it’s possible for a passive infrared motion detector to falsely trip because someone made a change in the environment surrounding it that represents human motion to the sensor. Unwanted alarms, on the other hand, are user generated, such as a store manager who mistakenly closes the door on his way out a few seconds after the exit delay has expired, or one of the employees forgot his/her user PIN (Personal Identification Number) when entering early in the morning. User generated alarms are the leading cause of unwanted alarms and the cure for that is a combination of training and self awareness on the part of management. So the question is, what kind of maintenance is reasonable and customary where it comes to burglar and fire alarm systems. First, there really is no choice in the degree of maintenance required for a fire alarm system in this modern day and age. Fire code requires that most fire alarm system components be inspected twice a year and functionally tested once a year. You as the alarm system owner are permitted to conduct one of the visual inspections yourself, providing you keep a detailed record of them on hand at the location. Annual testing, however, must be conducted by a licensed fire alarm technician that holds certification for this in the state of Ohio, or whatever state you happen to be in. Burglar alarm systems are usually good for the first year after they are installed, but it’s a good idea to have the alarm company inspect and test your system once a year after that. Is there a code that requires you to do that? Not on a national basis, and certainly not within the state of Ohio, but the fines that will ensue if you fail to maintain your burglar alarm in working order will prove to be significant as it has in many cases. Electronic Systems Consultants (ESC), which is based in Columbus, Ohio, offers inspection and testing services for all burglar and fire alarm systems. Our technicians are trained and certified on all major brands. Not only do we offer the quality, timely service you require, but we also provide top, quality central station monitoring at very reasonable prices. The next time you find yourself in need of help with your fire or burglar alarm system, think ESC. Give us a call at 614-754-1393 or use the convenient form below to reach me. is a full service systems integrator provider. In August of 2014, John Larkin, ESC founder and senior partner, was interviewed by Channel 10, CBS, in Columbus, regarding the State's MBE program. ESC is a State certified Minority (MBE, SBE, EDGE, LEDE) and VOSB company.